The name of this Part 8 perhaps should be ‘How to Recover From Mistakes & Problems’. I often intentionally make mistakes when recording videos to provide a teaching moment. Just as often, or perhaps more often, I make mistakes like anyone else and find myself in a ‘live video’ having to recover from them. That seems to have happened a lot in this Part 8. Being quick on my feet I seized the opportunity to use them as even more teaching moments. This Part 8 begins with an explanation of how I fixed up some toe kick assemblies and the stiles on the island. 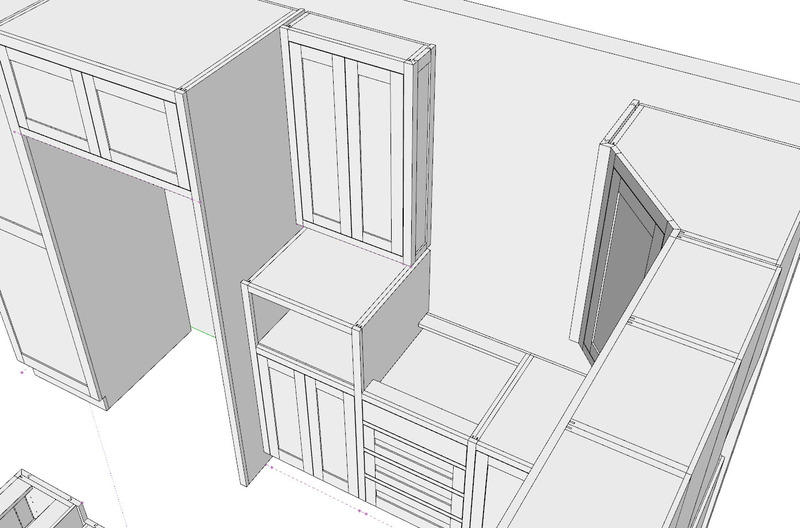 In the process of doing that off-line I noticed that I had drawn the spice cabinet and microwave cabinets too short and too shallow respectively. This was not an intentional mistake, but one anyone might make when drawing a lot of non-standard cabinets and constantly changing CabWriter Settings defaults. Fixing these two problems required different approaches because the spice cabinet was a standard upper cabinet while the microwave cabinet a divided base. In both cases, however, it involved retrieving the defaults stored in the cabinet, using the ‘Retrieve Cabinet Defaults’ tool, making one default change and then re-drawing the cabinet. This was all that was required in the spice cabinet case. The microwave cabinet was a little more complicated. Divided base and divided upper cabinets do not draw shelf and hinge holes when they are created. Those are added when the user uses either the ‘Insert a Door’ or ‘Insert a Drawer’ tool. Since those holes are added to the cabinet sides in a sort of post processing method, these tools set the ‘CabWriter Protected’ attribute. Making the microwave cabinet deeper would require moving the back shelf holes back in addition to making the sides deeper. Therefore the process required first unchecking the CabWriter Protected check box for these sides, re-drawing the cabinet and then deleting the old doors and adding new ones to re-draw the holes. Divided cabinets permit a great deal of flexibility, and I really like using them. However, if you make a mistake they are slightly more difficult to repair. This was clearly demonstrated when I discovered my next unintended mistake in the corner and divided upper cabinets. The cabinet was protruding into the wall 1 1/2″. The original sin was making the wine box of the divided upper 1 1/2″ too wide. The fix is too complex to describe here so perhaps this is a good time to turn on the TV and watch the movie.